•	prepare for Kim Jong-un to visit Seoul, the first time a North Korean leader would do so. 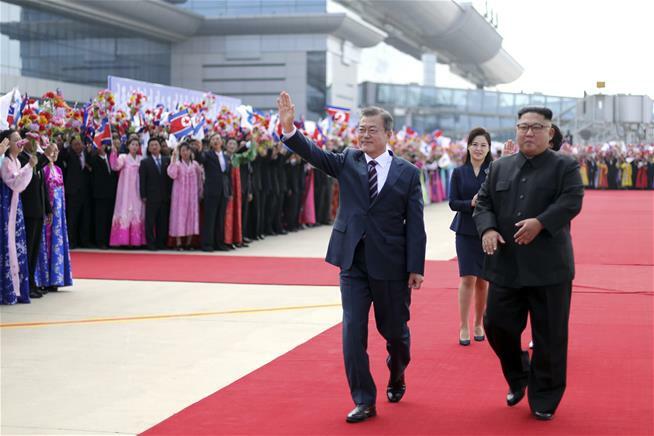 Granted, like the April 27 Panmunjom Declaration that Kim Jong-un and Moon Jae-in issued following their first summit meeting at the border, the declaration constitutes mostly pledges, which means reliance on goodwill rather than any enforcement mechanism. But such pledges surely encompass more potential than sanctions for reducing the prospect of violence or the North’s reliance on nuclear weapons. Sanctions in fact have consistently failed to move North Korea away from expansion of its nuclear and missile programs, not only because of the North Koreans’ rejection of pressure tactics but also because Russian, Chinese, and other businesses have fairly easily cheated, especially on oil transfers at sea (www.reuters.com/article/us-northkorea-sanctions-un/north-korea-has-not-stopped-nuclear-missile-program-confidential-un-report-idUSKBN1KP026). Yet, as an analyst with a major South Korean think tank said, the inter-Korean declaration will not please “inflexible” hard-liners in Washington, who consider sanctions “the best and only tool for denuclearization.” (Cheong Seong-chang, a senior analyst at the Sejong Institute, http://www.nytimes.com/2018/09/19/world/asia/north-south-korea-nuclear-weapons.html). Donald Trump professed to be “very excited” by the September Declaration, and a spokesman for the UN secretary-general welcomed it and urged all members to support it. We should recognize how far the North Koreans have come, in company with the South Koreans, toward reducing the threat of war, building trust, and moving discussion of Korean security onto the plane of diplomacy. We should also recognize, as I have argued here (Post #209) and elsewhere (https://globalasia.org/v13no3/focus/summit-misdirection-trumps-north-korea-ploy-to-tackle-iran_mel-gurtov), that Trump is now more determined than ever to squeeze Iran rather than bother with North Korea. Look at his and John Bolton’s latest warnings to Tehran—“there will be hell to pay . . . and we will come after you” said Bolton—as against Trump’s continuing praise of Kim and newfound flexibility about the time frame for North Korean denuclearization: “If it takes two years, three years, five months, doesn’t matter” (www.telegraph.co.uk/news/2018/09/27/trump-praises-beautiful-letter-kim-relaxes-nuclear-weapons-demands/). It “doesn’t matter” because Trump would rather let the South Koreans handle Kim and focus his attention on the people who, politically and economically, matter most to him: the Israelis and the Saudis.